Learn how issues such as accountability, privacy, personal ethics, and spiritual assessment play an integral role in the success of a chaplain. And don't miss the advice the authors offer about health and empowerment issues for chaplains, emphasizing the importance of chaplains caring for themselves even while providing care for others. "The Work of the Chaplain is a clear, concise text that offers essential understanding of this critical caregiver role in a variety of public contexts. This should be required reading for students in formation or introductory pastoral care classes in seminary, persons in their first unit of Clinical Pastoral Education (CPE) and for any clergy or layperson considering chaplaincy as a vocation." Teresa E. Snorton, Executive Director, ACPE, Inc.
"There is scant reflection from a Christian perspective on what it means to be a chaplain in today's pluralistic workplace and world. Naomi Paget and Janet McCormack fill this gap marvelously with ideas and perspectives born out of extensive experience, bringing much needed resources to both new and seasoned chaplains in all types workplace settings." David W. Miller, Ph.D., Executive Director, Yale Center for Faith & Culture. 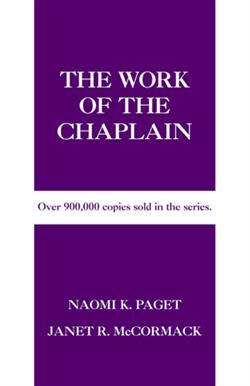 "Naomi Paget and Janet McCormack bring real life chaplaincy experience to this very important book and it shows. In this ground breaking work, they bring excellence to the task of unlocking the often closed door to understanding what chaplains do, how they do it and why it is so vitally important to the fabric of any society. Bravo!" Mark Cress, President, Corporate Chaplains of America, Inc.
Naomi Kohatsu Paget is a board certified chaplain with the Association of Professional Chaplains and crisis interventionist for the FBI, Southern Baptist Disaster Relief, and American Red Cross. She is the author of Disaster Relief Chaplaincy (North American Mission Board) and also has broad chaplain experience in the workplace, parish, healthcare, community, and law enforcement arenas. She is an adjunct professor at Golden Gate Baptist Theological Seminary and Denver Seminary, with a D.Min. from Golden Gate Theological Seminary and an M.Div. from The Southern Baptist Theological Seminary. Janet Rae McCormack is a board certified chaplain with the Association of Professional Chaplains and an American Baptist Churches USA clergyperson. She serves as Denver Seminary's Chaplaincy Training Center Director, and is assistant professor of chaplaincy and pastoral counseling. A retired Air Force chaplain, she has extensive experience in military, hospital, police, prison, NASCAR, crisis, trauma, and industrial chaplaincy. She holds a D. Min. degree from Denver Seminary, and an M. Div. degree from Southeastern Baptist Theological Seminary.